1986 Holiday Rambler Corporation Aluma-Lite model C-Class 24’ XL. Ford F-350 chassis 460 V-8 Auto, Onan 4.0 KW generator with only 129 hours, dash and roof air conditioning with heat strip, basement model, dual tanks, tilt wheel, cruise control, awning, rear bath, trailer tow pkg, only 54,650 original miles, hardly used, new tires. 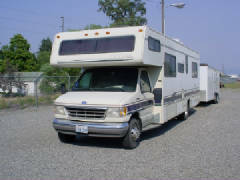 1995 Tioga Montara by Fleetwood. 31’ C-Class, rear island bed and room to sleep eight. Ford E-350 Chassis with the world famous, 7.5L V8 powerhouse and automatic overdrive transmission for fuel economy. Onan MicroLite 4000 series generator with only 51 actual original hours. 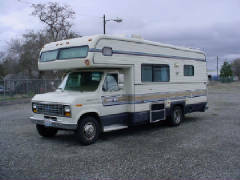 This motor home has been used on a couple of family vacations and also the odd weekend. Included are two panasonic video televisions, whirlpool microwave / convection oven, magic chef cook top, in floor forced air heating, rooftop ac / with heat strip, CB Radio, huge awning, trailer towing with wiring package and an incredible amount of additional storage. Very well maintained with only 11K actual miles and in exceptional condition, showing very little wear. New tires just installed and completely serviced and ready to go.